Consider this lace-weight yarn liberated. 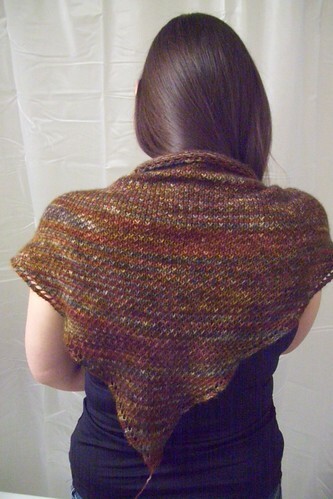 Eye of Partridge Shawl, 100% cashmere. How I’ll wear it most, with the point front-facing, tucked into my coat. This is a dead-simple triangular shawl that takes full advantage of eye-of-partridge stitch, creating a cozy double-thick fabric with subtle, elegant diagonals. Due to the alternating slipped stitches, this pattern also makes the colours in variegated yarns “pop” dramatically, and helps eliminate pooling. I used one single skein of Handmaiden 100% cashmere 2-ply (lace-weight) yarn, in the colourway “Mineral” (274m/50g), and 3.75mm Addi Lace needles (80cm circular). Repeat pattern rows until you get sick of it, or begin to worry about running out of yarn. Cast-off row: Russian bind-off (k2, k2tog with these 2 stitches, *k1, pass previous k2tog st back, k2tog*). This edge curls. If you don’t like that, then I’d probably just work several rows of garter stitch and bind off loosely. Fancy-pants among you could also chose to finish with a small knit-on lace border. Beautiful stitch to show off a beautiful yarn! Well done, and thanks for sharing!! It’s beautiful! So much so that I’m going to rummage through the “resource centre” tomorrow to see what catches my eye. Very pretty – love the colors in that yarn too, sorta warm and drifty! It’s looks great! Love the eye of partridge stitch on the colours, very nice. Love those colors! It’s a beautiful shawl. Beautiful work Em! I love the colors and the texture!! That’s beautiful! I have some Handmaiden cashmere that I knit into a moebius, but it doesn’t lay right on my shoulders. I think I’ll frog it and make this! That’s just fabulous! Too often eye of partridge stitch is tucked away in your shoes, with no audience. That’s beautiful! Why is it that everything I want to knit is bound to either speed up the arthritis process so I get it at 27, or make me go blind in just as short a time! But that truly is gorgeous! I trekked over here from the Knitty blog, and I’m adding you to my blog roll. Cheers! I love it! Thanks for the great idea. I just saw your shawl on Amy’s blog and had to come a take a closer look. I absolutely love your shawl. It is beautiful. I must go buy me some Handmaiden to make one of my own. I just saw this on Amy’s blog, too. You’re brilliant!!! I just got some Hand Maiden Camel Spin that I’ve been mulling on what to do with. I think I’ll adapt your pattern to make a rectangle scarf with it. Lovely!!! Yet another thing I’m itching to get on the needles. Thanks!!! 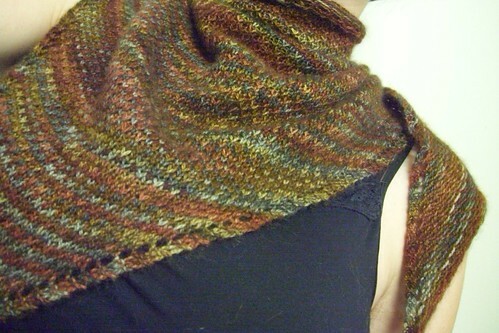 i’m going to knit that for my shawl-loving friend… or maybe for me. lovely shawl! I have an idea for this stitch pattern…must go dye some yarn! I can’t work out the russian binding off for the Eye of Partridge Shawl – I realise I must be thick – am I missing something? I have a dumb question..did you slip 1 purlwise or knitwise? This will make a difference in the overall pattern if I don’t use the right one. 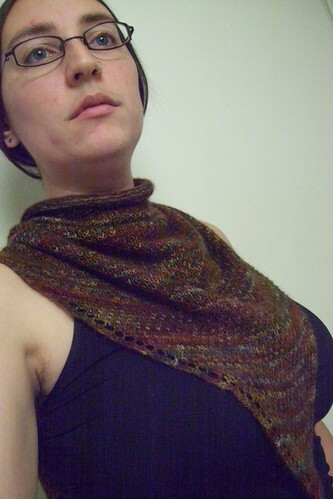 Thanks….love yourblog and your shawl. Beautiful shawl! Thanks for sharing the pattern. I love how the stitch pattern really brings out the color, making it pop and keeps it from pooling. You have inspired me to make an Eye of the Partridge hat of Sherpard Worsted. The Eye of the Partridge stitch is breaking up the pooling nicely and the yarn carried between the slip stitches will make it nice & cozy on a chilly, windy day! Gorgeous! I like the way it shows the yarn colors. 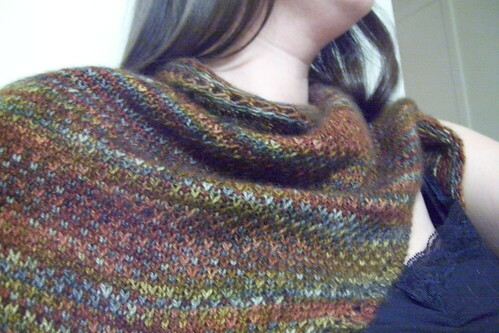 Given that my name is Partridge, it is imperative that I knit this shawl. I will do so with some Cleckheaton DK that I brought back from Australia as a souvenir. Thanks for sharing the pattern. Heya! Was searching for an easy (and WARM) texture stitch other than plain ribbing to use for a hat – LOVE your idea of Partridge Stitch in the round. Will let you know how it turns out – thanks so much for the thought! I just completed my shawl last night and I love it! Thanks for posting such an easy & addictive pattern, it was perfect for the one skein of handspun lace I bought on a whim. Did you knit the EoP cowl? Have you posted a pic of it somewhere? All of the pics are on the blog post. I knit it and designed the pattern as posted.